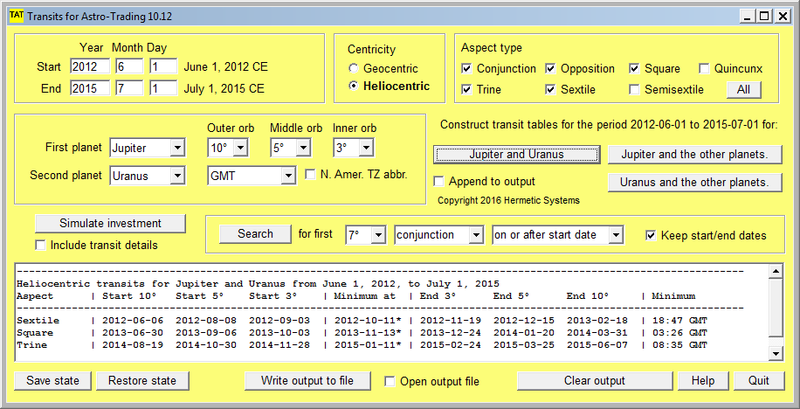 Software to calculate exact start and end dates of geocentric and heliocentric planetary transits. World planetary transits (a.k.a. mundane planetary transits) occur when two moving planets possess a particular angular relationship (called an aspect) with each other (e.g. conjunction, opposition, trine, square, etc.) with respect to a central point, which is either the Earth in geocentric astrology or the Sun in heliocentric astrology. A transit (more exactly) is the period during which two planets remain continuously in a particular aspect with each other. This software calculates the exact dates and times at which transits between selected planets (including the Sun in geocentric astrology, and the Earth in heliocentric astrology) begin and end (relative to chosen orb values from 1° to 15°). The heliocentric conjunctions of Jupiter and Saturn occur once every twenty years (and a few months). The period varies due to the variation of the speed of these planets in their elliptical orbits around the Sun.